Widgit Online’s Browse pages give you a more visual way of looking through and viewing your documents. These pages work well when students are browsing and reading on iPads. Browse all – This shows you all of the folders and files that you can see on the Documents page. Browse Published – This shows you all of the published folders and files. You can share the web address of any published folder or file for anyone to view. Note: Folders that contain no documents will not be shown in the 'Browse' pages. When you're in a folder, there will be additional navigation buttons. The Home button allows you to return to the root of your files, and the Up button will take you to the folder that contains the current folder. Folders are shown with a large folder button. If you have added a symbol icon to the folder then this will appear on the folder. Documents are shown with a large file button, or by the symbol icon if one is set. To set a symbol icon go to the Document List and click the Rename icon. 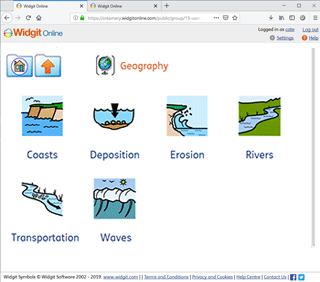 In the box that appears, you can search the Widgit database for a symbol to use. If documents or folders don’t have a symbol icon, the Rename icon will be highlighted orange. Users in Group Accounts have additional navigation buttons when browsing. My files - This is where you’ll find the documents from your ‘My Documents’ folder. Shared files - This is where you’ll find the documents from ‘Shared Folders’. Other users' files - This is where you’ll find documents created by other users. Note: Everyone can see all of the published files, but you will only be able to see unpublished files and folders that you have permission to see.